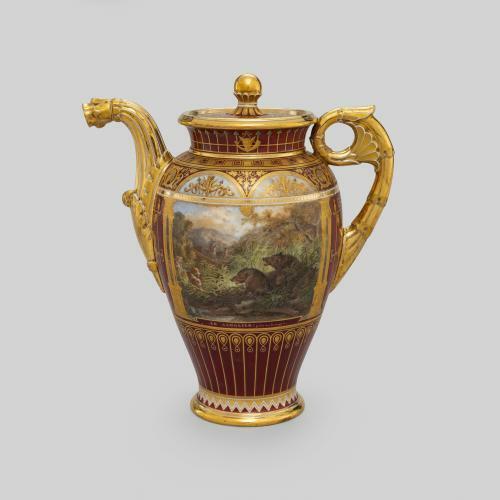 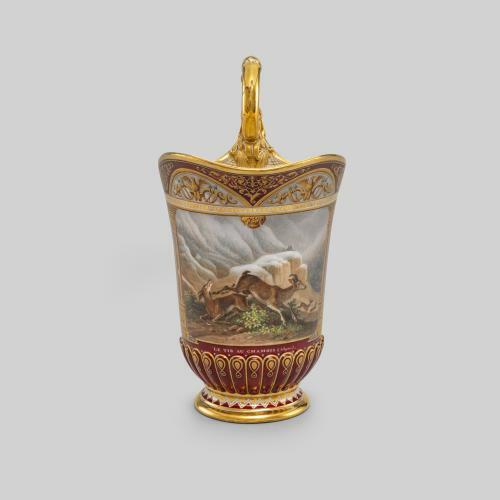 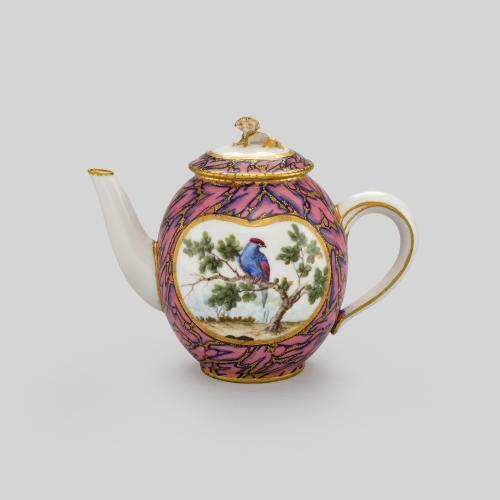 A great patron of Sèvres, King Louis-Philippe of the French (r.1830-1848) took a keen interest in the output of the factory and commissioned numerous services for his residences and as gifts. 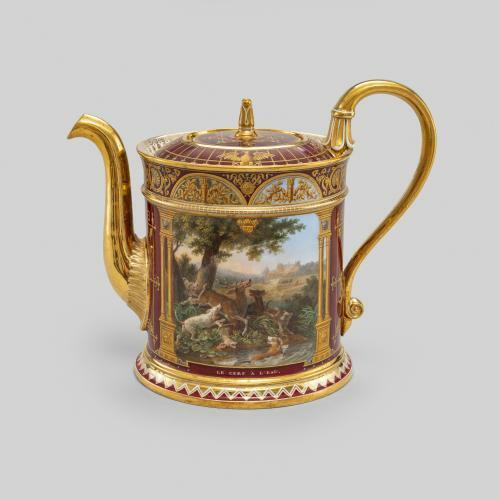 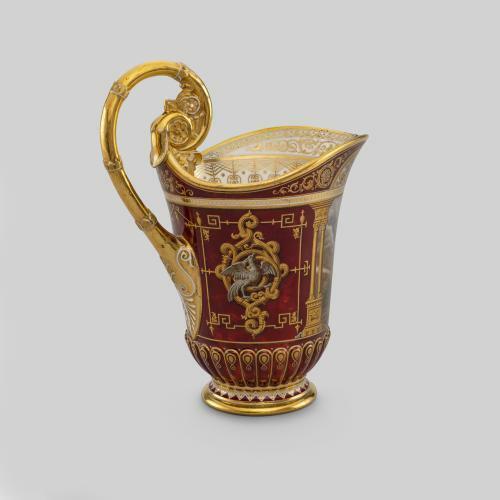 This tea and coffee service, entitled the Déjeuner Des Chasses Diverses, was delivered to Queen Marie-Amélie on the verbal order of the King on May 21st 1840. 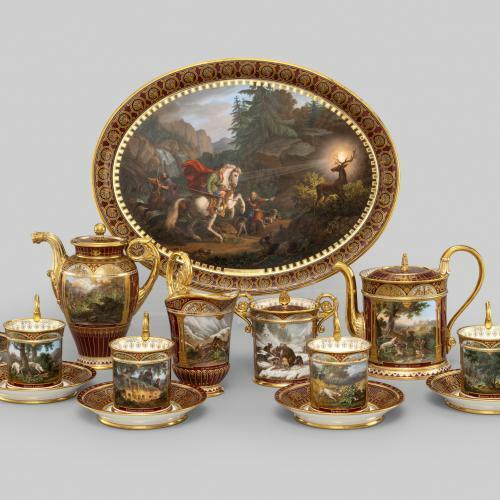 One of a number presented to the Queen throughout his reign, the déjeuner is composed of a large oval tray, a coffee pot, teapot, sugar bowl and six cups and saucers. 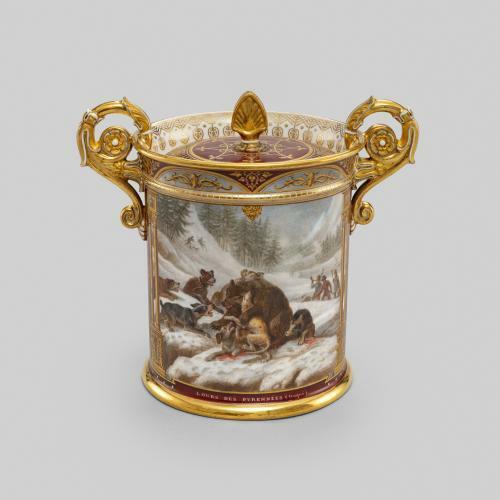 Each piece is decorated with either one or two hunting scenes underneath which are explanatory inscriptions. 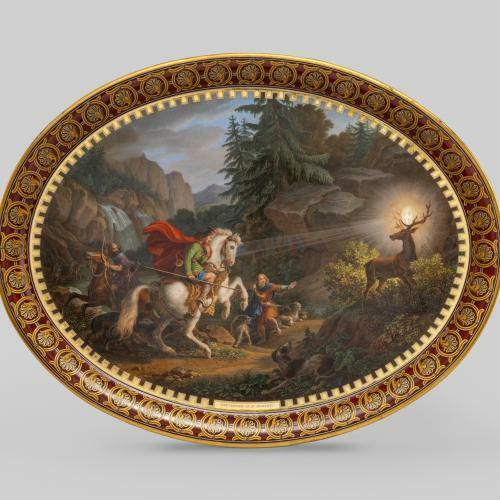 The tray depicts the conversion of Saint Hubert (c.656 – 30 May 727), the patron saint of hunters who, according to legend, was out hunting on Good Friday when he saw a vision of a stag with a crucifix between its antlers. 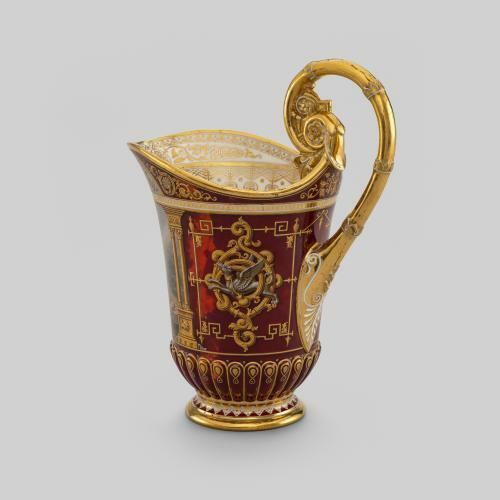 Following this incident he devoted his life to Christ, becoming Bishop of Liège in 707. 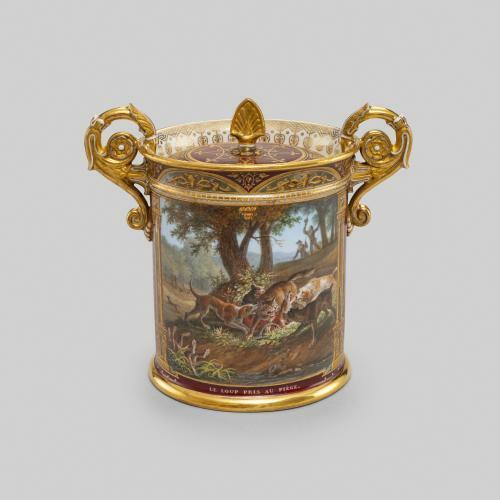 The tray is an impressive example of the painterly skill of Jean-Charles Develly, one of the most prominent painters working at Sèvres between 1814- 1847. 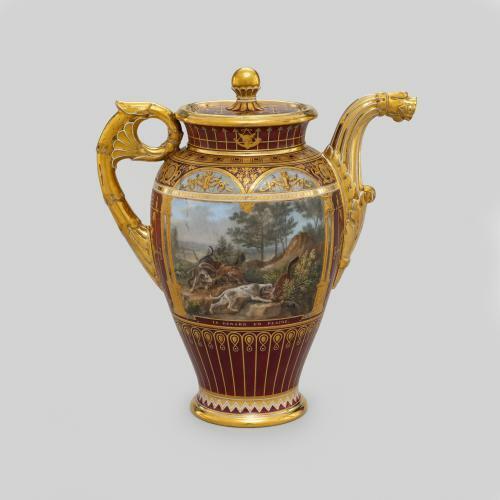 Christian iconography is used throughout the service and the cups and milk jug bear motifs including representations of three of the four Christian Evangelists; the Lion of St. Mark, the Ox of St. Luke, and the Angel of St. John. 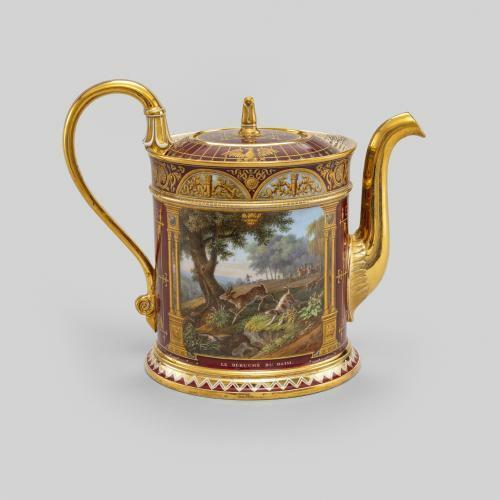 This subject matter would have appealed greatly to Louis-Philippe and Marie-Amélie in particular, who was well known for her piety and charitable work.